First place goes to a baker I love, admire, and respect. From Sweden, she is called Helene Johansson and she has bakeries in various locations in Stockholm and Southern Sweden, the main one being the Brunkebergs Bageri. With two excellent books to her name, talent, hard work, and a big and generous heart, I have learned a great deal from her over the years. Her baguette recipe is in her first book, and because there are not THAT many terms used in the bread world, you could get it in Swedish, spend some time with Google translate, and bake your way through it quite easily. 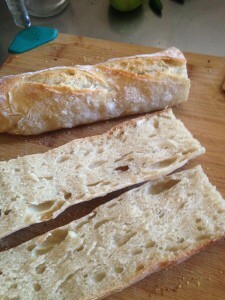 To give you a taster, here is her baguette recipe which I had actually never tried and which I loved. First place in the search for the best baguette recipe (mine excluded for fairness!). This recipe has been French Approved by my wonderful IT developer and his family. The only comment he had was that he felt it was a bit salty. I quite like salty bread so I don't agree and the point is that it's up to you. There is no more salt than in any of the other recipes so it could be that Marc is just really sensitive to salt. Fantastic flavour - poolish ads flavour. Fantastic texture (thin crispy crust, open crumb but not too open, humid and slightly chewy - poolish contributes to chewiness). Dough is reasonably easy to handle - 75% hydration with 26% poolish. Lovely colour (not mine because sadly the power went off about 3 minutes before they were finished baking so they did not get all the colour they could). If you are using dry active yeast, measure the flour into a bowl and make a well in it. Add the dry active yeast and pour over enough of the water to fill the well. Leave it for 10 minutes. You may or may not get a beige sludge on top. Don't worry about it. As long as the yeast is within the sell by date, and the water is room temperature you will be fine. You just want to dissolve the yeast. Add everything else including the poolish and bring it together into a rough mass in the bowl. Leave it for 15 minutes to think about itself and then pull it out and knead it for 10 minutes. Return it to the bowl and cover it. Let it sit for 2 hours. If you are using fresh or instant yeast, measure everything into a big bowl including the poolish and bring it together into a rough mass in the bowl. Leave it for 15 minutes and then pull it out and knead it for 10 minutes. Return it to the bowl and cover it. Let it sit for 2 hours. Remove the dough from the bowl, put it on a floury surface, and divide it into at least four (if not six or eight) pieces. Let these sit on little floury islands for 15 minutes. Take each one and gently stretch them out into small rectangles. Fold the top edge to the middle and gently press down. Fold the bottom edge to the middle and press down. Now fold the top edge right over to the bottom edge and, using the heel of your hand, press down firmly to seal the sides and the bottom edge, cupping the dough as you do this so that it keeps its round shape. Pick up the dough and move it away from you. Roll it toward you applying pressure with your hands to the sides to stretch out the dough. Don't apply downward pressure - just stretch the dough out sideways. 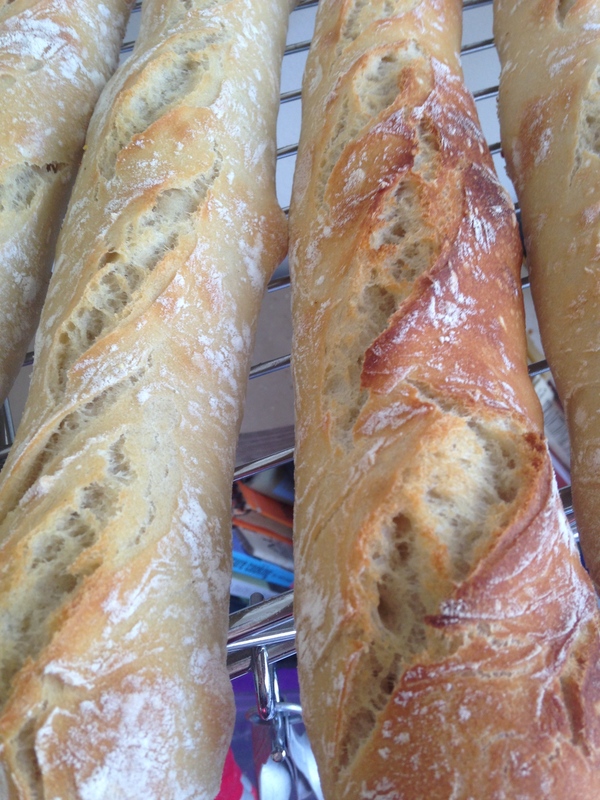 I don't like pointy ended baguettes so I leave them rounded so that the entire baguette is the same diameter. Place the shaped dough on a heavy cloth or tea towel that you have heavily floured and let it rest for 30-45 minutes. 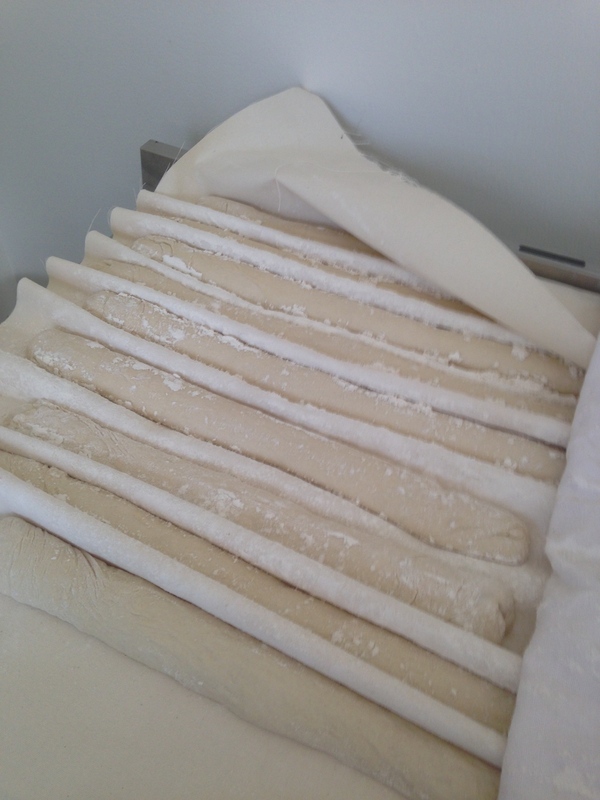 The baguette bakeoff babies lying in their beds - a thick linen cloth, heavily floured, that supports them as they ferment. After 30 minutes poke it with your finger. If the indentation comes out within a minute, the dough is ready for the oven. If not, leave it for another 10 minutes or so. Pre heat the oven to 230 celsius. Humidify the oven by lavish use of a plant sprayer. Slash the baguettes and put them in the oven. Bake for 15-20 minutes and then remove. Let cool completely on a wire rack. Want to learn more? Come and take a baking course with us! Learn all about flour and how to use it to make your own fantastic bread. 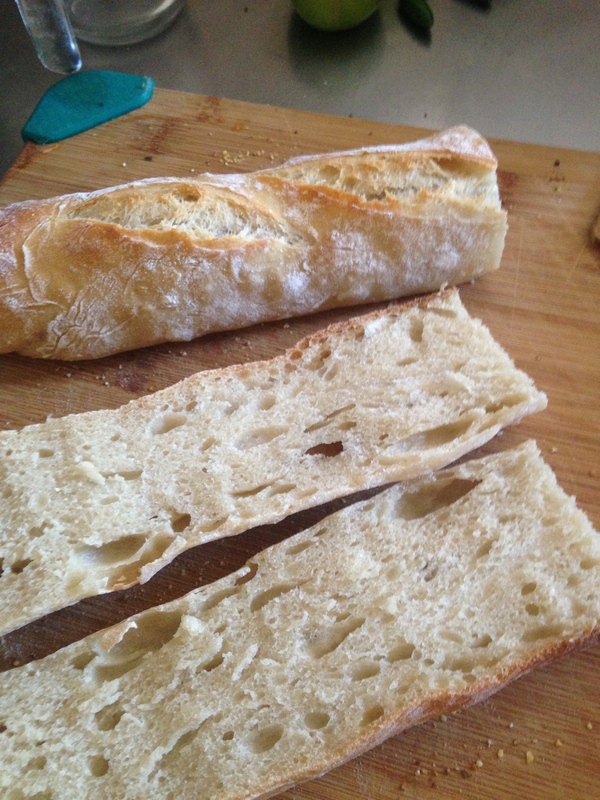 Next up - in between fascinating posts on other bread matters - is baking the perfect ciabatta! this is not a dumb question at all. flour is the main event and so it’s a complicated answer to a simple question. French flour is unique to France. It is milled in a particular way and it has a much higher enzyme level than the average flour in the UK (more enzymes = more activity in the dough when the flour is combined with the yeast = more bubbly and faster to rise). That is one characteristic. The other thing is the gluten content. English flour is labelled (strong, extra strong, plain) and there is no corresponding French flour. So…..you just need to understand that you wont get the perfect baguette. That, and the fact that you don’t have a steam injection in your oven, I presume! We can but do our best. To closely approximate french flour I would use 1/2 plain and 1/2 strong. However, if you don’t have both, just use one! Really….give it a go and see how it turns out!